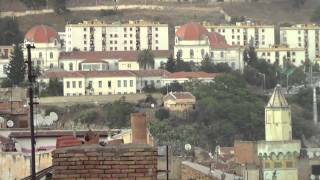 N 36° 21' 54" and E 6° 36' 52"
Constantine in Constantine Province with it's 450,097 citizens is a city in Algeria about 197 mi (or 318 km) east of Algiers, the country's capital city. Local time in Constantine is now 04:29 PM (Sunday). The local timezone is named Africa / Algiers with an UTC offset of one hour. We know of 8 airports in the vicinity of Constantine. The closest airport in Algeria is Mohamed Boudiaf International Airport in a distance of 6 mi (or 10 km), South. Besides the airports, there are other travel options available (check left side). There are two Unesco world heritage sites nearby. The closest heritage site in Algeria is Djémila in a distance of 49 mi (or 79 km), West. Looking for a place to stay? we compiled a list of available hotels close to the map centre further down the page. When in this area, you might want to pay a visit to some of the following locations: Mila, Skikda, Oum el Bouaghi, Guelma and Batna. To further explore this place, just scroll down and browse the available info. Let's start with some photos from the area. 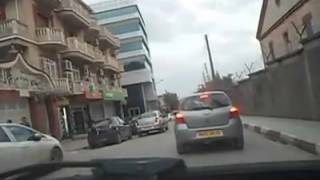 ICI : http://adf.ly/120vac شاهد الفيديو كامل عبر صفحة الفايسبوك Voir la vidéo dans la page Facebook http://adf.ly/120vac. la ville de constantine et suika by fs jocker. Compilation des actions du joueur Ahmed RANI contre l'ES Sétif en championnat de Ligue 1 Algérienne. Balade dans le nouveau téléphérique de constantine spéctaculaire et magique !! Sorry for the shakes folks, i was filming without the tripod. Cirta was the capital city of the Ancient Libyan Kingdom of Numidia in northern Africa. Its strategically important port city was Russicada. Although Numidia was a key ally of the ancient Roman Republic during the Punic Wars (264 BC–146 BC), Cirta was subject to Roman invasions during the 1st and 2nd centuries BC, eventually falling under Roman dominion during the rule of Julius Caesar. Located at 36.3675, 6.61194 (Lat. / Lng. ), about 0 miles away. 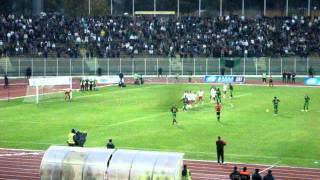 Stade Mohamed Hamlaoui, known as Stade Chahid Hamlaoui is a multi-use stadium in Constantine, Algeria. It is currently used mostly for football matches. The stadium holds 40,000 people. 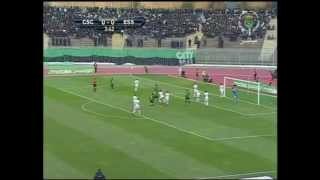 It serves as a home ground for CS Constantine, and MO Constantine. Located at 36.3492, 6.62583 (Lat. / Lng. ), about 1 miles away. Mohamed Boudiaf International Airport, also known as Mohamed Boudiaf Airport, is an airport in Algeria, located approximately 9 km south of Constantine; about 320 km east-southeast of Algiers. The airport has been given the name of President Mohamed Boudiaf. Located at 36.2824, 6.61707 (Lat. / Lng. ), about 6 miles away. Ramadan Ben-Abdelmalek Stadium is a multi-use stadium in Constantine, Algeria. It is currently used mostly for football matches. The stadium holds 20,000 people. It serves as a home ground for MO Constantine and CS Constantine. Located at 36.2667, 6.5 (Lat. / Lng. ), about 9 miles away. El Khroub is a town and commune in Constantine Province, Algeria. According to the 2008 census it has a population of 179 033. Located at 36.2667, 6.7 (Lat. / Lng. ), about 8 miles away. Didouche Mourad is a town and commune in Constantine Province, Algeria. According to the 1998 census it has a population of 33,266. Located at 36.45, 6.63333 (Lat. / Lng. ), about 6 miles away. Ibn Ziad is a town and commune in Constantine Province, Algeria. According to the 1998 census it has a population of 15,514. Located at 36.3833, 6.46667 (Lat. / Lng. ), about 8 miles away. 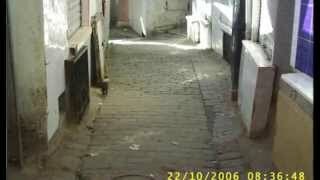 Zighoud Youcef is a town and commune in Constantine Province, Algeria. According to the 1998 census it has a population of 31,101. 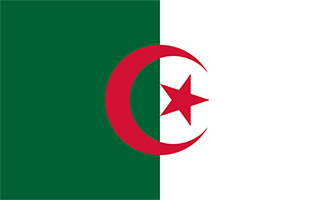 The town was formerly known as Smendou, and was renamed to its current name in honor of Youcef Zighoud, a guerrilla leader who was killed fighting for Algerian independence against the French. Located at 36.5333, 6.71667 (Lat. / Lng. ), about 13 miles away. Terrai Bainem is a town and commune in Mila Province, Algeria. According to the 1998 census it has a population of 20,645. Located at 36.3189, 6.74361 (Lat. / Lng. ), about 8 miles away. 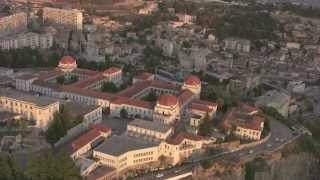 The Constantine Aerial Tram is an aerial tramway in Constantine, Algeria, carrying commuters through the gorges of the river Rhummel to link the eastern part of the city at the place Tatache Belkacem (formerly rue Thiers) to the west in the city Emir Abdelkader, to the University Hospital Ben Badis. Opened in June 2008, it has 33 cabins detachable 15 seats each, connecting the two terminals in 8 minutes and carry 2,400 people per hour. Located at 36.3697, 6.61472 (Lat. / Lng. ), about 0 miles away. These districts belong to Constantine. These are some bigger and more relevant cities in the wider vivinity of Constantine.